Xiaomi is one of those companies that never ceases to surprise us. As well as being one of the largest smartphone manufacturers in China, the Asian company has shown that it not only excels in the mobile phone industry. From spinning machines to heated vests and air conditioners, it is impressive how many products the Chinese firm has launched through its associated brands, including electric bicycle manufacturer HIMO, which recently added to Xiaomi’s store a new product, the C20. Of course, I remember their last two products: HIMO V1 and HIMO H1, which are known for their novel design and quickly gained a large market share. HIMO is a Chinese manufacturer of electric bicycles, and has just launched a model called HIMO C20, which stands out above all for its range of 80 km and an average speed of 25 km/h. 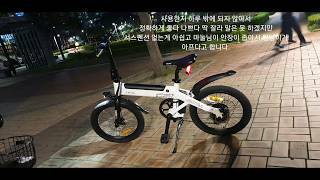 This bicycle has the particularity that it will be Xiaomi who will put it on sale in Europe through its official channels. The Asian giant had already entered this segment, but now does so by reinforcing its catalog with this product from a very specialized manufacturer. Part of that weight is due to the removable, rechargeable 18,650 mAh battery, which alone weighs 2.5 kg. It takes 6 hours to charge and has splash protection, which guarantees its IPX5 certification. Following specifications, the HIMO C20 has an average speed of 25 kilometers per hour, more than enough to reach our destinations in a considerable time. On the other hand, the bike, which weighs 21.1 kilograms, has a chassis made entirely of aluminum, which also incorporates eye-catching details such as a folding handlebar. On the handlebars there is a small information display showing the remaining range and data on speed or distance travelled. In terms of price, the HIMO C20, Xiaomi’s new proposal for personal electric mobility, is expected to cost approximately 350 euros, at least taking into account its current value in China. It is estimated, however, that its price is a little higher because of the import issue.